Money 20/20, Las Vegas, NV. – Oct 24, 2017 – Today myGini Inc., a San Francisco-based provider of leading-edge software solutions for the fintech sector, announced the unveiling of its integrated payments and loyalty application, myGini. Launched at Money 20/20 in Las Vegas, myGini represents a true innovation in the U.S. financial services market. myGini is an integrated payments and shopping app that connects cardholders, retailers and banks. 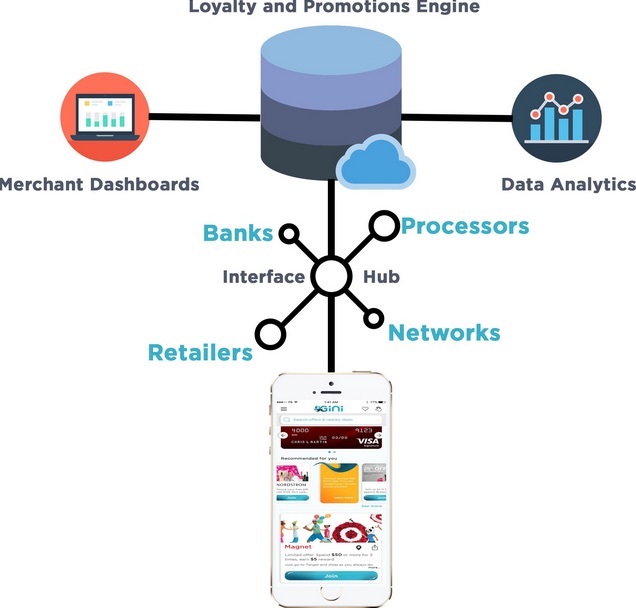 By serving as a bridge between MasterCard/Visa networks and financial institutions, it delivers an enhanced shopping experience for consumers, while increasing transactional volume for retailers and banks. Through this initiative, the company will minimize integration efforts required from banks and retailers by leveraging their current infrastructure and integrating myGini systems with MasterCard and Visa APIs. At the same time, myGini will offer retailers an extensive range of offer platforms to replace paper-based coupons and rebates. Lastly, the firm aspires to build traction in the mobile-wallet niche by harnessing existing card transactions. myGini will exhibit in Booth 850 at the Money 20/20 conference hosted in The Venetian from October 22-25. The world’s premier event for financial payments and services will gather more than 11,000 attendees from 4,500 companies and 85 countries. Founded in 2016, myGini Inc. is headquartered in San Francisco and financed by a group of private investors. For more information about the company, please visit www.mygini.com. First Data Partners with UnionPay International to Enable In-Store in the U.S.